Instant Messaging is very famous now a days. It gives real time chatting facility. There are many methods for instant Messaging. 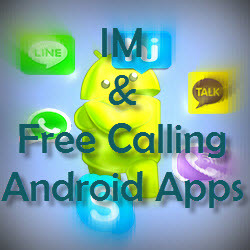 But as Android gets into every pockets, IM and Free Calling Apps are made specially for Android Lovers. IM apps for Android gives you instant messaging opportunities with least data usage. Some Apps also offer free/cheap calls to other devices. Here are some mostly used IM apps for you Android Devices. LINE is a new communication app which allows you to make FREE voice calls and send FREE messages whenever and wherever you are, 24 hours a day! LINE has been ranked no. 1 in the free app category in 44 countries including Japan, Taiwan, Thailand, Spain, China, Hong Kong, Singapore, Malaysia, Macau, Switzerland, Russia, Saudi Arabia, United Arab Emirates and more! Hike is a new messenger that lets you send free messages to your friends and family! With hike you can message friends that are on hike and also those who aren’t on hike too! You’ll never have to use another messaging app again. Better yet, its absolutely FREE! hike uses your 2G, 3G or WiFi (when available) to message with friends and family. I have Shared some mostly used Android IM apps. Hope you find this useful. Your shares and comments help us to improve ourselves .